In our travels, we’ve run into lots of businesses and communities that want to accommodate cyclists but don’t know how. It might be a community on a popular Adventure Cycling route or on one of Oregon’s new Scenic Bikeways and they want to give cyclists a reason to stop. While bike friendliness really comes down to just plain old good customer service, here are a few simple items that you could carry and market to cyclists. Most cyclists will be carrying some sort of portable mini pump. While these work for quick on-the-road repairs, nothing beats a good floor pump to get tires back to pressure. The floor pump should accommodate both Schrader and Presta Valves (ideally without having to fiddle with the head) and a working and accurate gauge is a plus. Having a set of tire levers for the supremely unprepared would be an added bonus. Again, most cyclists will be carrying a patch kit, but if they are on the road long enough they may run out. This has happened to us on occasions when we’ve hit a string of flats and used up all our patches AND spare tire. They are relatively inexpensive and you could either sell complete kits or individual patches. There are tons of patch kits out there but the best kind is the Rema TipTop. The scalloped edges hold on to a tube best. Many traveling cyclists, whether they are touring or are in town for an event ride, probably won’t carry a good lock, due to weight and bulk. Because of this, you’ll often see cyclists eating at establishments with outside seating or where they can constantly monitor their bike. Having a U-Lock to rent or borrow would provide piece of mind and would also encourage cyclists to explore more businesses in town, since they don’t have to constantly guard their bike. It’s important to have a lock with appropriate security for the area. Generally, a combination U-lock would be good to offer since they are more secure than cable locks and there are no keys to lose! 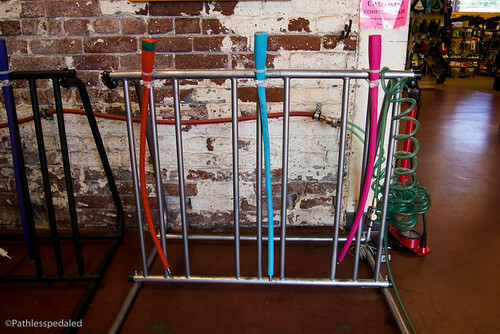 River City Bicycles offers an indoor bike rack with a series of cable locks for customers to temporarily lock up. Some cyclists about to do some serious eating at this diner. Chosen primarily because we could monitor the bikes. Repair stand clamp arms cleverly bolted on to the outside of Halcyon, a bike shop in Nashville, TN, for customers to work on their bikes. They are unbolted and brought in every night. A great Cadillac option to offer would be a repair stand. Having a bike off the ground makes it easier to clean and fix drivetrain issues. It could also be used by cyclists who fly in for an event ride and have to assemble or disassemble their bike. 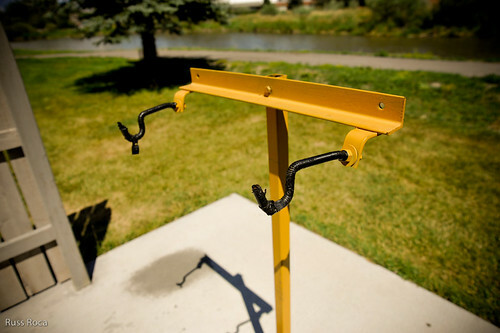 We’ve seen repair stands offered in many different ways, from off-the-shelf solutions like a collapsible Park stand, to some homemade DIY solutions like at Bike Camp at Twin Bridges, MT. This design merely has two prongs that stick out and support the top tube. This will work for most standard diamond frame bikes, but would be problematic for folding bikes (that is where a clamping system would come in handy). Simple DIY bike stand in Twin Bridges, MT. Cyclists rely heavily on maps. 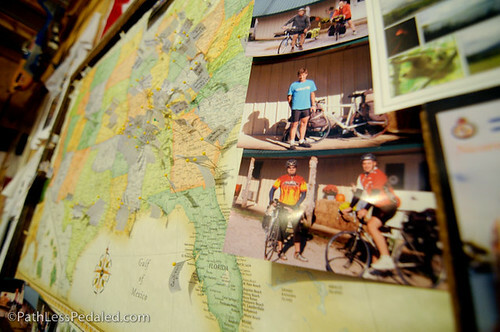 If you’re near an Adventure Cycling route, post a copy of the local maps on a board. If you’ve got a local cycling club or even just a handful of riders, have them create a few maps of local rides and display it near the counter. These are all small but additive cues that lets a cyclist know that you are a bike-friendly business. In the same vein, having a few inexpensive bicycle repair items can go a long way to reach cyclists. They are as much marketing materials in-and-of themselves as they are practical tools. Purchasing a $40 pump for cyclists and advertising it on your website, will provide more ROI than a $300 print ad. For us, if two hotels offered the same services and same prices, but one of them had a repair stand or a pump, we would choose the bike-friendly one even if we weren’t going to use the pump at all. Just the mere understanding that the business views cyclists as valuable to cater to would win us over. Being bicycle-friendly is actually fairly simple. It’s no more difficult than offering good customer service. If you would like to hear more about our experience with bike-friendly communities as bike travelers, email us here. I usually also suggest to lodging proprietors that they have a stash of towels or rags they don’t mind cyclists using to wipe down wet and dirty bicycles. 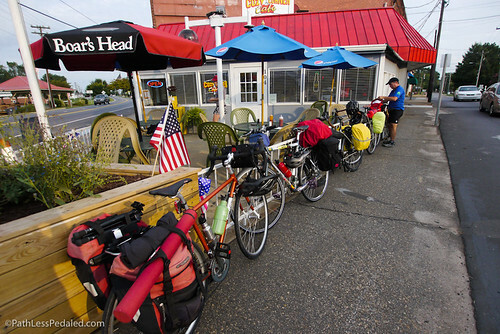 We too are trying to create the right space for bicyclists on the Oregon Coast. We have added a new Biking camp area to our campground that not only offers incredible views but free wifi, water, power, New restroom\showers and an on-site laundry. We will definitely add some of these suggestions to these sites. That’s great to hear Ken! Let us know what improvements you guys do and send photos. We’ll help spread the word. I love the idea of repair stands mounted to the outside of the building!! Now a shared tool kit system will accompany this well. Good racks to lock to (like the spiral locks), placed in a well-lit, well-watched area. If I can’t park my bike safely, I’m not visiting your store.